Brandon Powell, a third-year Samford University McWhorter School of Pharmacy student, was selected to receive the highly acclaimed Student Leadership Award from the American Pharmacists Association Academy of Student Pharmacists (APhA-ASP). Powell is one of only four students in the nation to be selected for this honor. Established in 1983, the award recognizes outstanding academic achievement and leadership of APhA-ASP members who are in their next-to-last year of pharmacy school. Currently, Powell serves as president of Samford’s APhA-ASP chapter. He was nominated for the award by his peers. Powell considered many careers within the health professions before deciding upon pharmacy. He found pharmacy’s focus on direct patient care particularly appealing, as well as the variety of available career opportunities. His first exposure to pharmacy was when he turned 18 years old and began working as a pharmacy technician at a Publix in his hometown of Pelham, Alabama. Powell knew early on that he wanted to attend Samford University’s McWhorter School of Pharmacy. “When I started pharmacy school, I knew I wanted to get involved and do a lot more than just come to class,” Powell said. 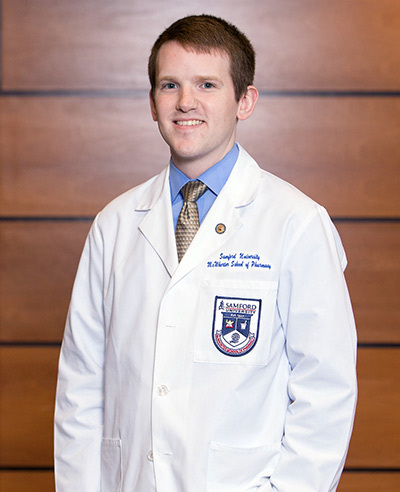 In addition to serving as the president of Samford’s APhA-ASP chapter, Powell has been an active member of a variety of organizations including Alabama Society of Health-System Pharmacists (ALSHP), Student Society of Health-System Pharmacy (SSHP), American College of Clinical Pharmacy (ACCP), American Association of Colleges of Pharmacy (AACP) and Alabama Pharmacy Association (APA). Powell is also a McWhorter School of Pharmacy student ambassador. “My involvement in these organizations has allowed me many opportunities to use the knowledge I’ve learned in the classroom and apply it to patients,” Powell said. Through his involvement with APhA-ASP, Powell has also learned how to be an advocate for pharmacy. He has spoken with state and federal legislators regarding advocacy efforts within the field. Powell will be officially recognized and presented with the APhA-ASP Student Leadership Award in March at the APhA Annual Meeting and Exposition in Nashville. Samford’s McWhorter School of Pharmacy has 11 pharmacy-specific student organizations—many of which are nationally recognized—which equip students with confidence, skills and knowledge to be leaders not only among their peers but in the health care industry as a whole.